Do you love chickadees and wrens? Would you like to see them in your yard on a daily basis? 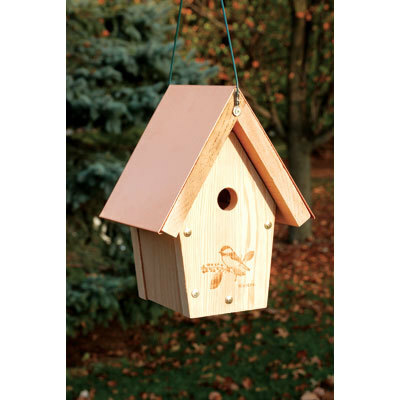 The classically styled Woodlink Coppertop Hanging Chickadee – Wren House Bird House with its 1 1/8th inch hole is specially designed to attract either chickadees or wrens. This re-forested, kiln dried, inland red cedar bird house with a laser etched wren on the front is a sure fire way to spruce up your yard by inviting some of your favorite feathered friends to take up residence there. Hole Size: 1 1/8 in. Depth: 6.75 in. / 17.2 cm. Width: 7.50 in. / 19.1 cm. Height: 11.00 in. / 28 cm. Weight: 3.50 lbs. / 1.58 kg.